Our fish of choice is Tilapia and it is marinating in lime juice to which aji amarillo a specialized hot pepper has been added along with, slices of white onions (red onions would go well here too), sliced jalapeños, seasoned with salt and freshly ground black pepper. I do not add cilantro because I believe the traditional Peruvian method is to add flat leafed parsley and not cilantro. This dish is served with boiled sweet potatoes and steamed corn. 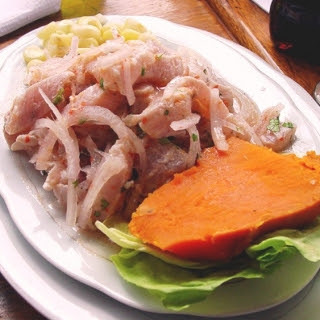 Sometimes Peruvian restaurants top the cebiche with "cancha" which is a roasted and salted large dried Peruvian corn kernel similar in taste to corn nuts. The following recipe is pretty close to what my mom makes. And once again, this is strictly a Peruvian dish, not Mexican or Ecuadorian (although I am sure their variation on this dish is tasty too).